“Occupation” shows that, no, the Rebels writing and production team did not forget the wider context of the universe as they were taking Ezra on his adventures across the galaxy. 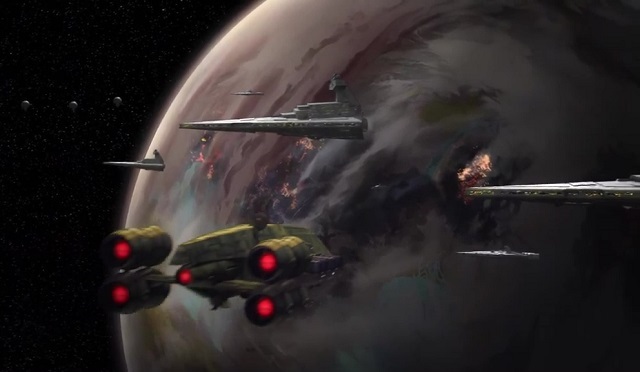 Events on Lothal have progressed since he has been there last, and we finally, fully see the consequences of what has been planted in the show’s backstory since its inception. The Empire is methodically, deliberately and unscrupulously killing Ezra’s home planet for its own material gain. In some ways, it’s an even more impactful reveal than when we found out that Ezra’s parents had died in Imperial custody. We never saw Ezra’s parents onscreen; we only interacted with them in his memories, and his search for them is as much about what he does in response to their absence as actually discovering their fate. But the show was built on Lothal, almost the entire first season was based there, the planet is as much a part of the show as Ezra himself is. 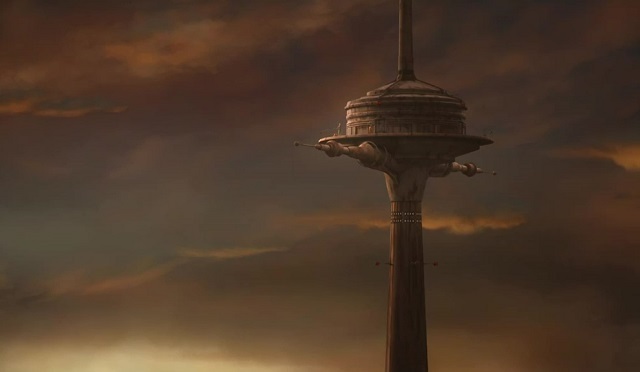 Seeing the sky of Lothal as a dust-choked miasma of reds and blacks, full of swirling clouds and filth that blocks out the sun above the capital city, it’s akin to when Kanan was blinded back at the end of season two: a massive, irreparable wound torn through the status quo. It affects everyone of course, but it affects Ezra most of all. When he sets out at the beginning of the episode, he vows to Mon Mothma and the others in his crew that Lothal is his place, that he’s ready to devote all his efforts to free his home from Imperial rule. This is the goal he’s set forth for himself since “The Siege of Lothal” when Darth Vader chased them offworld, to return and finished what his parents started. But when he sees the extent of the damage, sees how deeply the Empire’s influence has sunk into what he saw as incorruptible bastions of independent ideas, he despairs and all but gives up, reminded of Saw Gerrera’s words that his world is already lost to him, and all he has left is to fight back against the ones who took it from him. It’s against this grim backdrop that we’re launched into the second episode this week. “Flight of the Defender” is, in a lot of ways, a throwback episode. The plot is very similar to an episode from the first season, albeit with higher stakes and a much more threatening villain presence, but the first half of the episode’s emphasis on humor and banter, with the physical comedy being a highlight, feels like a return to the show’s roots. And from a setting perspective, away from the capital, Lothal doesn’t look that bad. The sky is clear and blue again, and the Imperial presence is limited to their bases and facilities, leaving a wide operating theater for Ryder and the rest of the Lothal resistance. It’s a very stark contrast. It’s likely to avoid the show becoming too grim and too obsessed with its own darkness, but “Flight of the Defender” is almost a breath of fresh air, both for its tone and its sense of fun. Ezra and Sabine are in danger, for sure, but it’s the fun, adventurous sort of danger that flows naturally out of Star Wars as a whole. Rebels will circle back to the situation on Lothal as a whole as the rest of the season plays on, but “Flight of the Defender” does something important by distracting him from that and giving Ezra a bit of a break. He now has another mystery to solve. Loved seeing Ezra’s progression through mentors in this show. We’ve already seen him reject Maul, Hondo, Yoda the Bendu, and starting to reject Mon Mothma and Saw’s leadership while growing ever more comfortable with Kanan’s leadership. Whenever he has wanted something, a mentor has been readily available to give it to him. When he wants to destroy the Sith, Maul; to gain power by becoming a Jedi, Yoda; to run from the Rebellion, Hondo; to find his place in the galaxy, Bendu; to free Lothal by any means necessary, Saw; to fight the Empire at large, Mon. But he’s rejecting all of these because, somehow, Kanan is helping him find the balance in all of these things. The Force gave him a new family and is making sure he stays there. My question is: does Ezra know yet that is his name? But I wonder what the wolf’s message means for Kanan. He has always been on the run: first, from the Purge. After that, Caleb never really had a place. On Gorse, as Kanan, he had to hide who he was until Hera shows up. He never fit in as a Jedi, but he still flirted with the Force. He also bristled at the thought of joining another army as they formed up with Phoenix Squadron. He didn’t want to work with clones, either. Now that he also has a place on the Ghost, I wonder if he’ll face his final challenge: give up the name Kanan Jarrus and become Caleb Dume again. He’s always been running, and now that he has a home, can he be himself again? I love how Ezra continues to reject Mon’s platitudes and barely catered speeches. He knows what he wants. I’m sure a lot in the Rebellion want to save their world. Saw offers something different: a chance to do something about his world. I think the wolves are, of a sort, a way for the Force to tell Ezra he’s right where he needs to be to save Lothal. It won’t be Saw, it’ll be Dume who helps him free the planet ultimately. Ezra just has to trust his instincts, which have been correct in regards to nature before, and trust that it’ll be the final answer. And, compare Saw here, saying that Lothal is already lost with what he did to Salient. Either the Empire or Saw will burn down a planet, just how?